Air atomized spray nozzles are the most common type of atomizing nozzles and are offered in many specialized designs. Available in virtually any material and several spray angles, another fluid (usually air) is mixed with the process liquid. The resulting spray is a high velocity flat or full cone pattern of very fine droplets. With this type of nozzle your air and liquid pressure ratios play a very important role in the droplet size received. 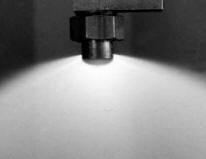 Some of our air atomizing nozzles can generate droplets as fine as 10 microns SMD. Air atomizing nozzles are often used for lubricating, scenting, coating, moisturizing, humidifying, cooling and gas conditioning because they can generate a range of droplets from fine to very fine in size. Air Atomizing Droplets can generate the finest droplet sizes of all atomizing nozzle types, as low as 10 microns SMD. Imagine two droplets of the same size, one droplet you break up [atomize] into 1000 smaller droplets and the other you leave alone. If you measure the surface area of each "small droplet" and add them up, the result will be more than the total surface area of single large droplet. Simply put, the smaller the droplet size, the more surface area you'll have at a given flow rate. More surface area translates into more efficient heat transfer, surface contact or reaction within a gas stream. "Which is better, a Twin Fluid Atomizing Nozzle or Hydraulic Atomizing Nozzle?" As with most questions in life, that depends! Air atomizing nozzles usually have lower flow rates and as a result are measured in gallons per hour (GPH) vs. gallons per minute (GPM). In order to generate very fine droplets with hollow cone nozzles it often requires operating at higher discharge pressures (up to 2,000 PSI) and air atomizing nozzles require a compressor or blower air of some type. So the droplet size and flow rate required as well as the resources available all play a part in the decision making process. This is Where We Can Assist! Most customers do not know what droplet size they require. They may not even know the flow rate required. Although each application has its specific requirements, you can tap into our experience for recommendations. In some cases a certain residency time is desirable, such in SOx reduction applications. In many applications the droplets require a certain mass and velocity in order to provide the distribution desired within a pressurized reactor or high velocity gas stream. These are all factors that help determine the droplet size required. We can work with you to help minimize the guesswork and maximize your spraying efficiency.